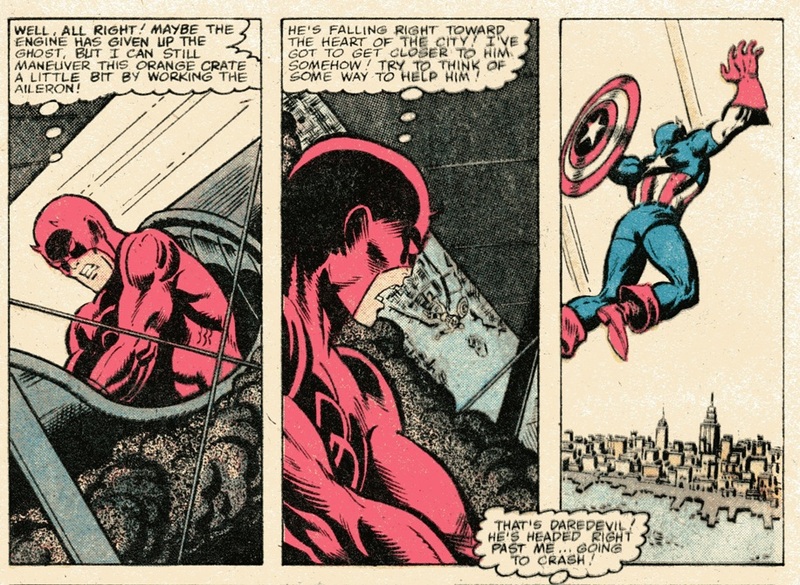 A Daredevil team-up with Captain America (from 1979)! Thank you Mark, aka The Comics Professor, for alerting me to the panels below and being kind enough to scan them for me! This will just be a brief post since I’m gearing up to record the next issue of the TOMP podcast this weekend, but I hope you guys will enjoy the panels below, from Captain American #235 and #236 as much as I did. This arc was written by Roger McKenzie (who was also on Daredevil at the time), with art by Sal Buscema. For Captain America #236, Michael Fleischer is listed as scripter, which I assume means that McKenzie just handled the overall plot. You can read about said plot, and see more panels at SuperMegaMonkey’s Marvel Chronology page for this story. 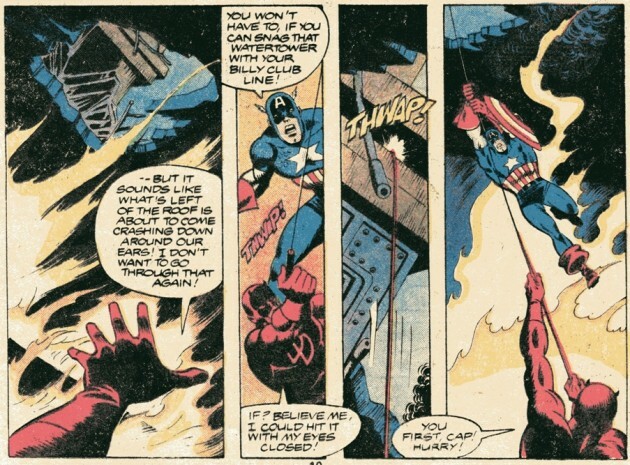 Do take a look, or you’ll miss such gems as Daredevil asking Cap to stop calling him “son” and Steve Rogers vacuuming his apartment with his shirt off. I kid you not. As for this post, let’s just feast our eyes on the three scenes below. The first one features Daredevil making a classic joke (that I’m a little surprised he hasn’t made more often): “Believe me, I could hit it with my eyes closed!” Yes, you could, Matt. Good for you. Below, we see Daredevil and Cap dive into the water. 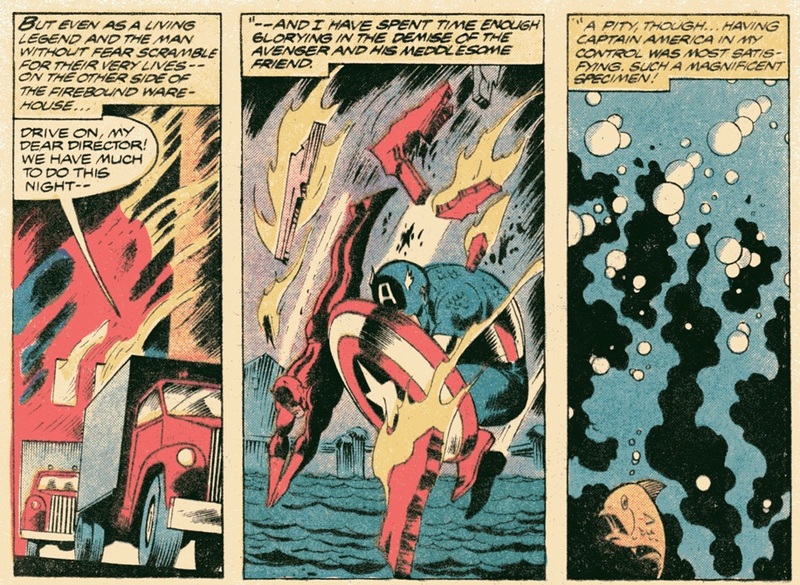 I really don’t know how the heck that jump is going to work out for Cap. He looks like he’s trying to re-enter the Earth’s atmosphere. Daredevil, on the other hand? Dix points. Yes, that’s the second time I’ve used French on this site in under a month. Maybe I subconsciously want to go to Paris. Last, but certainly not least, we have the blind man flying a plane scene. Strangely enough, this is something like the third time Matt has flown a plane, not counting the rocket he landed in Daredevil #2 (vol 1). I was almost going to stick this post in the “Seeing things” category on account of Daredevil’s reference to the plane as an orange crate. However, I realized that Matt was likely referring to the race car, not the color of the plane. Which, by the way, isn’t orange at all. Okay, that’s it for now! Everyone have a great weekend! I’m pretty sure he meant “orange crate” as in a crate used for containing oranges (the fruit), not an orange-coloured crate.